Silvio Calabi alerted his fellow NEMPA members to the re-invention of the wheel – a folding wheel manufactured by MORPH Wheels that facilitates traveling with a wheelchair – even in a taxi. For more information, check http://morphwheels.com. Calabi also called attention to two articles providing an overview of computer-controlled cars: Crash Course: Training the Brain of a Driverless Car by Susan Kuchinskas in Scientific American and a cover story in The Economist: Clean, Safe and It drives Itself. Tickets are on sale for the 2013 IMPA Test Days in Monticello, NY. Further information can be found at www.impa.org . 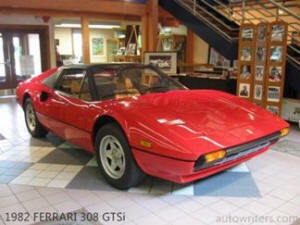 . . A 1982 Ferrari 308 GTSi is being offered by the International Motor Racing Research Center as its 2013 raffle car. Donated by Greg Galdi, the car has been driven fewer than 1,500 miles. The raffle is the Center’s major fund-raiser of the year in support of its work of preserving the history of motorsports. Raffle tickets are $60 for one or two for $100. Only 2,308 tickets will be sold. The drawing will be on Saturday, Dec. 7, at the Center at 610 S. Decatur St., Watkins Glen. Ticket holders do not need to be present to win. Tickets can be purchased by calling (607) 535-9044 or by emailing research@racingarchives.org. An order form is available on the Center’s website at www.racingarchives.org. Top Choice: Mazda 2014 CX-15; Adventure Choice: 2013 Nissan Pathfinder; Technology Choice: 2013 Ford Fusion; Luxury Choice: Audi A8l and GAAMA members named the 2014 Mazda 6 as the Green Car Choice for families. The group also elected Robert Palermo its president for the coming year. Brett Berk’s Vanity Fair column, Stick Shift, called attention to an outstanding automobile as art exhibit in Nashville’s First Center for the Visual Arts. 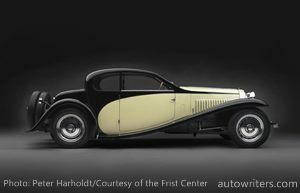 Curator for the show was Ken Gross who gathered 18 automobiles from the art deco era and two motorcycles for a display he titled “Sensuous Steel.” The Bugatti is one of several models validating the headline. The show lasts through Sept.15. Automotive design and technology will be a featured session August 7 at this year’s Car Management Briefing Seminars in Travis City Michigan. The seminars are organized by the Center For Automotive Research and annually attract experts from various areas of the car industry. Check www.cargroup.org for more information. Roman Mica reports that the Rocky Mountain Press Association’s series of ten racetrack performance reviews of new cars proved popular among readers of The Fast Lane Car and viewers on AOL or You Tube. RMAP’s next event is the Rocky Mountain 4XFall Sept.13, an off-road rally from Boulder, CO to the ghost town of Caribou, CO, and back, we trust. Click here for more info. In Texas, TAWA members have until July 30 to enter the group’s annual excellence in craft competition. Prizes are awarded for: best magazine, best newspaper and best Internet articles in English and in Spanish and best radio, video and photography entries. Entry rules are available here. The 25th anniversary gala of the Blackhawk Museum in Danville, Calif., near San Francisco, will be held Saturday, August 10 from 6 p.m. to 11 p.m. For more information and reservations email: museum@blackhawkmuseum.org . . . Just about 140 miles east of San Francisco the Ironstone Concours d’ Elegance in Murphys will once again enliven historic California gold rush territory on Saturday, Sept. 28, 10 a.m. to 4:30p.m. No guarantee of striking gold but the17th annual Ironstone Concours d’Elegance will feature over 300 antique, classic, special interest, sports and racecars. For more information go to www.IronstoneConcours.com. Or, telephone 209-785-4234. Proceeds support agriculture programs for youth. In the Los Angeles area The Palos Verdes Concours d’ Elegance promises 200 classic cars in 20 competitive classes on the grounds of the Trump National Golf Club. September 15. Some of the automotive designs by event Grand Marshall Peter Brock will be on display as well. For more information and tickets go to www.pvconcours.com or telephone: 1-866-522-7746. . . . There will be six million wheelchairs built in the U.S. next year but how many vehicles will be built or modified to accommodate them is not so certain. MPG members were told by speakers at its June luncheon that the demand for mobility vehicles is growing because veterans who come home disabled need transportation to get to work and baby boomers are getting older and encountering disabilities that come with age. Also, information about vehicles for the disabled is not readily available and different ailments can require different accommodations. In his piece for the July issue of MPG’s MilePost Journal, Brad Nelson noted that automotive media can help get information out on this neglected market segment.